To understand how neuron is represented as simple RC circuit. To generate and study action potential of a neuron using remotely triggered equipment. Amplitude: This can be simply explained as the peak to peak height of a signal or membrane potential. Frequency: The number of times, signals is produced per second. Offset: It is the voltage at resting potential. Duty cycle: The time duration that a signal is active. Unmyelinated neurons: Neurons that lack the axonal myelin sheath. Myelin sheath is an insulating material present around the axons facilitating saltatorial conduction. Myelinated neurons: Neurons with axonal myelin sheath. Can the biological equivalent of action potential be reproduced through electrical circuits? Here, we address this question by generating the action potential on electrical hardware built with simple components which can be remotely triggered by the user. After going through the Hodgkin-Huxley simulator (experiment 2) in Neurophysiology lab, you will become aware of the anatomy of nervous system and action potential. Here you will study about how to use a different approach of understanding action potential generation using a hardware equivalent of a neuron. The neuron is frequently compared to an electrical circuit, as it has many of the same properties and can be mathematically defined using similar (in many cases the same) equations and relations. Though the neuron and an electrical circuit have similar characteristics and follow similar basic principles, they differ in the expression of them. Neuron allows the brain to communicate with the rest of the body through the propagation of waves of depolarization, known as action potentials, along the axon membrane. Before being stimulated to transmit an electrical impulse, the cell membrane of a neuron is slightly polarized. The fluid inside has a negative charge relative to that outside of the cell because of the balance of positively-charged ions of potassium and sodium and negatively-charged proteins and chloride ions. 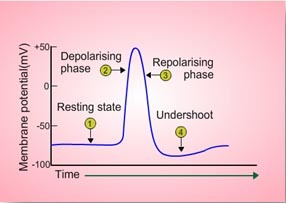 This polarized state is known as the resting potential. The resting potential tells about what happens when a neuron is at rest. It prepares a neuron for the propagation of an action potential or nerve impulse. The membrane potential of an unmyelinated neuron such as a cerebellar granule cell, changes during the transmission of an idealized neural impulse. The changes in the membrane potential are brought about by the opening and closing of certain ion channels, allowing the diffusion of ions into and out of the cell, and by protein transport molecules which pump sodium ions out of the cell and potassium ions into the cell. The ability to generate and transmit action potentials is a cellular specialization; cells that can produce action potentials are said to be action excitable. Excitability is a property of the cell membrane and is due to the presence of proteins called ion channels that span the membrane. The membrane potential, which is a characteristic of all living cell, provides the stored energy that allows changes in membrane potential to serve as a basis of information transfer in excitable cells. Channels respond to stimuli and give sensation which open and close rapidly in response to environmental influences. An open channel permits a flow of ions across the membrane an electrical current. These tiny individual current multiplied many times, provide the information flow that links the ten billion brain cell with one another. The plasma membrane of some cells is able to undergo rapid reversible changes in ion permeability that displaces the membrane potentials from the normal level. The ability to undergo these changes is utilized in signaling in the nerve system. The electrical changes register sensory stimulation or the presence of incoming signals from other nerve cells. Regions of the cell that can undergo action potentials are called electrically excitable regions. A path of current flow is set up between the region experiencing peak of action potential and adjacent region on outside of the membrane. If the membrane potential crosses the threshold value, an action potential is generated. The sodium channels open completely, sodium ions flood into the neural axon and the membrane is locally depolarized. This rapid diffusion causes the membrane to become oppositely polarized, that is, it overshoots neutral polarity and reaches a potential of +30 mV. At this point, the outside of the cell is negative relative to the inside. The reversal in polarity of the membrane causes the sodium channels close. However, the change away from the resting potential activates sodium channels in adjacent parts of the membrane. This causes the wave of depolarization caused by opening and closing ion channels (the action potential) to be transmitted along the length of the axon at speeds ranging from 1 to 100 m/s. In the declining phase of the action, the potassium channels open. This allows potassium ions to diffuse out of the cell and into the extracellular fluid, re-establishing the negative polarity of the membrane. The rapid diffusion results in undershooting of the resting potential by a small amount, at which point the potassium channels close. The electrical properties of neurons can be described in terms of electrical circuits. This approach helps us understand how a neuron behaves when current flows into it (for example, when ion channels open), or why unmyelinated neurons conduct more slowly than do heavily myelinated neurons. Current can flow across the neuronal membrane through a couple of paths. Resistors: When there are open ion channels, current can flow through these channels. Each ion channel is a small resistor - and the more open channels in the membrane the more resistors in parallel (so an overall smaller resistance). Conductance (g) is the inverse of the resistance. Conductance increases (resistance decreases) whenever ion channels open, whether due to ligand-binding, voltage changes, or other gating mechanisms. The larger the cell the more conducting surface there is apposed to the non-conducting membrane, so the larger the capacitance. 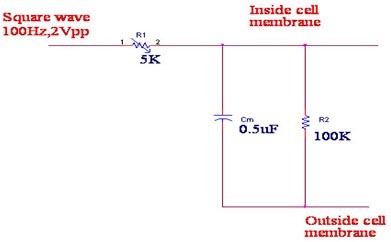 A given area of cell membrane has a fixed capacitance (the unit capacitance of cell membrane is approximately 1 microFarad per square cm), so the more membrane the greater the capacitance. A. 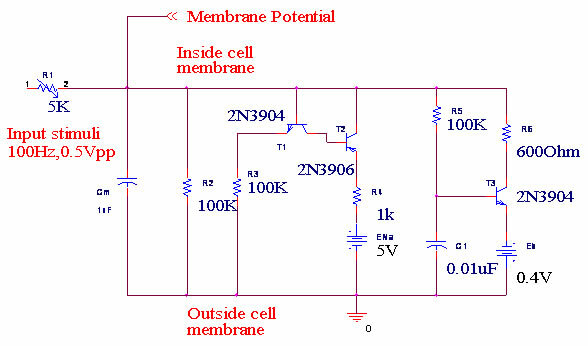 A basic RC circuit superimposed on an image of a membrane bilayer shows the relationship between the two. B. More elaborate circuits can be used to model membranes containing ion channels, such as this one containing at channels for sodium (blue) and potassium (green). The RC-circuit: The cell membrane can be modeled by a resistor and capacitor in parallel. In the figure, there are two resistors drawn, one is the constitutively open potassium channels that make up the leak current and are the dominant determinant of the resting membrane potential (Rleak). The other is a "variable" resistor that represents other ion channels that can be opened when their gate is activated (for example, by voltage-gating or ligand-gating). We have designed an analog neuron model using resistors, transistors, capacitors and externally input voltage. These all are some basic electronic components which will make analog neuron to behave like normal neuron. Resistance represents the difficulty a particle experiences while moving in a medium. It is measured in ohms. The inverse of resistance is conductance. Conductance is the ease at which a particle can move through a medium. It is measured in siemens. Because they are inversely related, high conductances are correlated to low resistance, and vice versa. It is important to note that generally speaking resistance and conduction in the neuron are dealing with the ability of ions to cross the membrane. Thus it often referred to as membrane resistance or membrane conductance. As such, when the majority of ion channels are closed, few ions cross the membrane, and membrane resistance is said to be high. The capacitor is a passive electronic components consisting of pair of conductors separated by an insulator. The cell membrane is also said to act as a capacitor, and has a property known as capacitance. A capacitor consists of two conducting regions separated by an insulator. A capacitor works by accumulating a charge on one of the conducting surfaces. As this charge builds, it creates an electric field that pushes like charges on the other side of the insulator away. This causes an induced current known as a capacitative current. It is important to realize that there is no current between the conducting surfaces of the capacitor. Capacitance then, may be defined two ways, 1) as an ability to store and separate charge, or 2) as the quantity of charge required to create a given potential difference between two conductors. Thus given a set number of charges on each side of the membrane, a higher capacitance results in a lower potential difference. In a cellular sense, increased capacitance requires a greater ion concentration difference across the membrane. Transistor is an active semiconductor device commonly used to amplify (strengthen) or switch electronic signal. Transistor has three legs: emitter, base and collector. Here we are using 3 transistors, two NPN and one PNP transistor. Transistor has mainly three terminals. Emitter (E), Base (B) and Collector(C). Transistor T1 and T3 are NPN transistor and T2 is a PNP transistor. For an NPN transistor collector voltage is more positive than emitter. So current flows from collector to emitter. For a PNP transistor emitter voltage is more positive than collector. So current flows from emitter to collector. Here we give an input excitation to the cell membrane as square wave form of amplitude 2Volt peak to peak (Vpp), since we want to obtain the output as pulse wave form. A square wave resembles to an impulse wave form in shape when pulse width is low. Here R1 represent a variable resistor which represent the membrane resistance and is inversely proportional to membrane conductance. By varying this R1 membrane conductance can be changed considerably i.e., when membrane resistance (R1) decreases the membrane conductance increases making flow of signals easier. Cm is the membrane capacitance. In any cell membrane there is a charge separation across the cell. The separation of charge by a insulator causes a capacitive effect on the cell. This effect is modeled as membrane capacitance. If there is only the resistor when the input voltage is applied, then voltage will be changed to steady state value, hence we are using a capacitor Cm along with it to resist this change. When the applied input makes the membrane capacitance to change above threshold value, then only neuron spikes. The membrane potential is measured with respect to ground. When the input excitation is given the membrane capacitance Cm begins to charge, when the voltage across the capacitor reaches more than cut in voltage of transistor T1, the transistor turns on and the current flows from collector to emitter. Then the base voltage of transistor T2 becomes less and T2 also turns on and current flows from emitter to collector. The neuron model here shows how a neuron produces an output of action potential in few volts. Actually in biological neuron the action potential will be in tens of millisecond. But for better analytical study we made the voltage in volts. When the input is varied we can see considerable changes in the size of action potential. a. The goal of this lab exercise is to generate the action potential of a neuron. The remote trigger equipment will control the stimuli and resistance operating on the cell. By varying these parameters, the action potential will be produced. Simple neuron model uses a power supply, function generator, transistors, resistors and capacitors. The action potential created by the analog neuron is plotted using standard Data Acquisition Equipment interfaced to a computer.